This Historical home is located in the heart of the downtown Napa. Built in the 1900's and fully restored in December 2007, the beautiful hardwood floors, wood ceilings, solid wood doors and old fashioned Bennington knobs make this home a charming getaway. The new kitchen is done with granite tiles and has a Tuscan feel with beautiful colors of the wine valley. The house has bedrooms 3 - one with a king size bed and plenty of room. The second room is outfitted with 2 twin beds with an office and desk. The sun shines through the day bedroom for a quiet nap in the afternoon or a read of your favorite book. The 3rd bedroom is downstairs with the mancave and master bath. The house is furnished with many old antiques. We have an original BUCKS stove that was used in the 1900's for cooking. The newly upgraded kitchen was done in an early 1900 wine country theme, however with modern appliances. The appliances included are: Gas Range, Microwave, Dishwasher, Garbage Disposal unit, Combo Freezer Refrigerator, Toaster, Coffee Maker, and all flatware, silverware, Calphalon cookware and utensils. Office area has room for your computer. Wireless setup or cable set up. The living room has all leather furniture, flat screen television with comcast as our provider. Enjoy the local entertainment and news. The bathroom is completely restored with a soaker tub with shower enclosure. Enjoy a nice quiet relaxing bath or shower with our European bath products. Luxurious monogrammed bathrobes and slippers are provided. Laundry facilities (washer/dryer) are located in the downstairs storage area. Iron and ironing board provided. Adirondack chairs provided on the porch--perfect for relaxing with a great wine you just found in a local, boutique winery and your favorite book. Backyard wine barn, pergala, vineyard and barbecue make this the ideal location. **Please note***This vacation rental is one of a limited number of legal short term vacation rentals properties in Napa County. There are no legal vacation rental homes for stays less than 30 days outside of the city of Napa, including Yountville, St. Helena and Calistoga, and the unincorporated area of the county, except those connected to a resort, such as Silverado. Even in the city of Napa, a vacation rental must have both vacation rental and business licenses from the city and pay the transit occupancy taxes. The city council wants to stop illegal rentals, so please be sure to rent a property that is properly licensed. Perfect for relocating to Napa- Downtown Luxury. We loved the Napa Valley and wanted to show people how to restore an old home to perfection. This was a labor of love. We restored 2 homes at the same time. Our vineyard, 'Ronveaux, the family vineyard' was added in 2009. Our wine is Ronveaux, Trinity 3 and Sweetheart. Thank you to my wonderful husband who had a vision and made this dream come true. Our cottage is located walking distance to Oxbow Market, Farmers Market, Chefs Market, wonderful restaurants, winery boutiques, cafes and spas. We are 10 minutes driving to the larger wineries. We are in the heart of downtown Napa. Double sinks, 2 person shower, toilet, laundry. The Corner Cottage was perfect! 5 women had plenty of space to get ready after a comfortable nights sleep. The backyard oasis was our start in the morning with coffee and our end in the evening with Susan’s amazing wine! So beautiful and peaceful!! Best part was Susan! She thinks of every detail and is the perfect host! Highly recommend and will definitely return! We stayed for a 60th birthday celebration/girlfriend trip to Napa. Susan’s house is very well stocked, and quite comfortable. Really nice linens, towels, spa bathrobes, and slippers. She provided a nice bottle of her wine and many goodies, including coffee, water and soft drinks. She’s readily available for any questions, and she is so kind. The courtyard is lovely and comfortable and there’s a grill for use. I gave 4 stars because the biggest bathroom and queen bed are in the basement, which doesn’t have a finished ceiling and is musty smelling if you have allergies. As well, the front steps are narrow and steep, and didn’t drain of water when it rained. This was a bit of an issue for one of our party that had a recent knee replacement. But ask Susan if the driveway level entry and inner stairs can be used when she is present for loading or unloading. As well, the table in the kitchen only seats 4 if you cook at home, which we did a couple nights. Overall, however, we loved the location and everything we needed in the house to feel at home. I especially loved having a nespresso cafe americano every morning!!! And the window seat in the kitchen was used by someone every morning..so nice!! Susan was a wonderful host and we loved the Corner Cottage. Great location, great accommodations! Thank you John for your kind feedback. It was such a pleasure to have you, your daughter and sister. I loved driving you too. I hope to see you all again this summer. The Corner Cottage was fantastic! 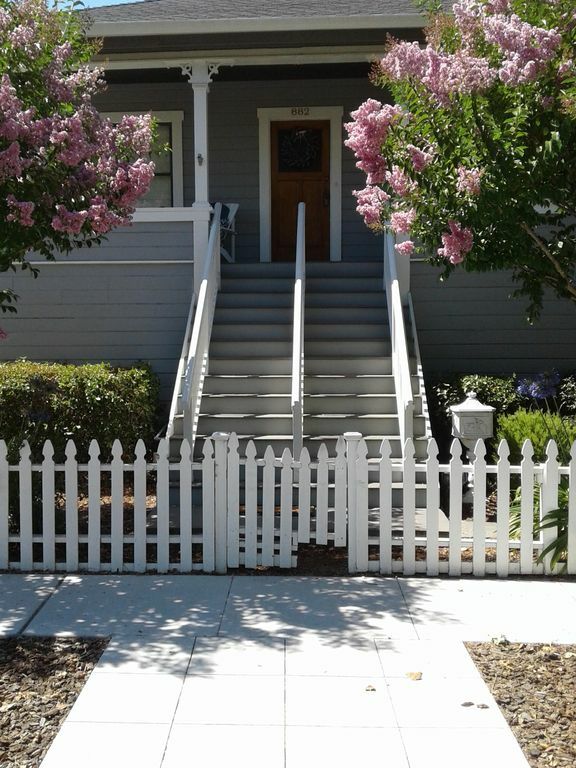 A very nice home within walking distance to everything in downtown Napa. The house is very well kept and clean. The backyard is amazing, with multiple places to sit and relax, view the onsite vineyard, and hang out in the wine tasting room. The owner of the property, Susan, was incredibly kind and helpful during our stay. I would absolutely recommend this property to anyone interested in traveling to Napa! It was a real pleasure to have you stay with us. Thank you Craig for the review. It was a pleasure to have you and your friends. The home is over 100 years old. We have tried to maximize all the space we could for the guests comfort. There is only so much room in these old homes. I will try to add a dresser to the king room in future. I really enjoyed meeting you, your wife and friends. Thank you again for the Film Festival critiques. Susan is amazing! We came to Napa to celebrate my 40th birthday and Susan was so helpful! She is warm and kind! She treated all of us like family! Both houses were stocked with everything we needed! She was helpful throughout the entire booking process. She is quick to answer questions and very knowledgeable about the town of Napa! We rented both properties and loved the quaint backyard with the beautiful vineyard and adorable wine room! I wish we were there longer than just a weekend so we could have enjoyed her properties even more! Thank you Susan for everything! We can’t wait to come back! Absolutely wonderful Birthday weekend for a Beautiful 40 year old!! Wonderful Guests, friends and family. I loved having you and your family! These mom and dads must be the "coolest" in the world. I am so glad you all got away and enjoyed our beautiful valley. Lets do it again next year!! Happy Fall and Holiday season. over 400 wineries within minutes, walking distance to fine dining and nightlife. Oxbow market is a short walk from the house. ****WE ARE LESS THAN A 7 MINUTE WALK TO BOTTLEROCK. Rates are subject to change. All guests must sign the City of Napa agreement.